Have a question for Bura Resort? "I'm currently staying and the hospitality is the best among what you can expect for normal hotels and resorts." "The garden and waterfalls are really beautiful." "There is a living area with a sofa in the room, which is nice." 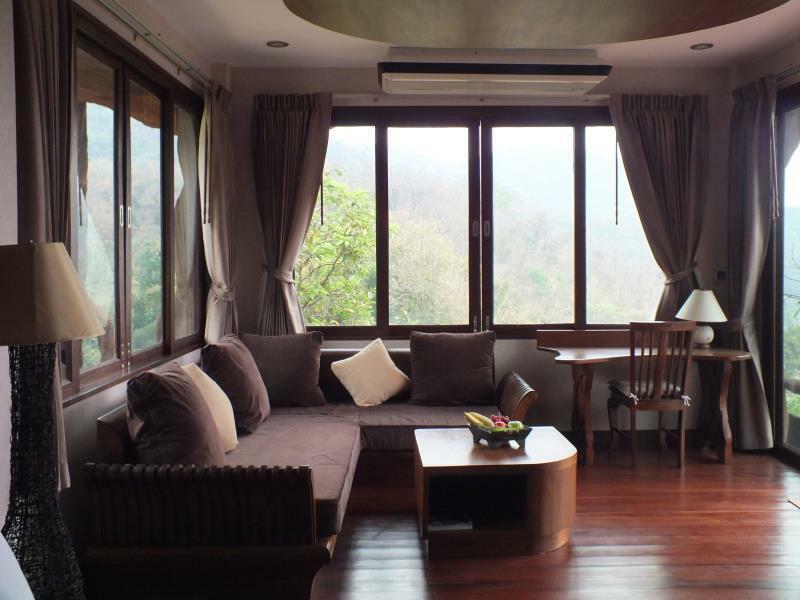 "Hannah, the manager, was wonderful in setting up transortati..."
For travelers who want to take in the sights and sounds of Chiang Rai, Bura Resort is the perfect choice. Only 10. Km away, this 3-star hotel can be easily accessed from the airport. 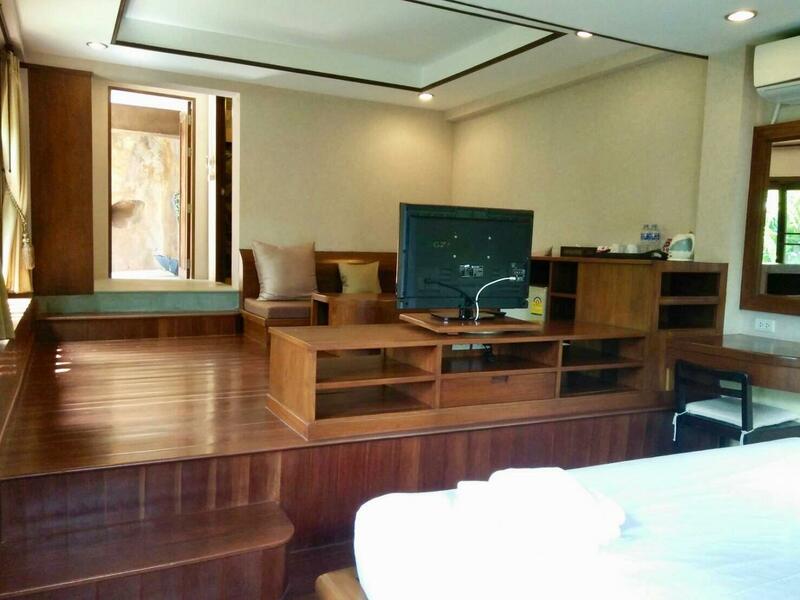 A well-kempt environment and its proximity to Baan Dum, Fah Thai Market give to this hotel a special charm. At Bura Resort, every effort is made to make guests feel comfortable. To do so, the hotel provides the best in services and amenities. For the comfort and convenience of guests, the hotel offers free Wi-Fi in all rooms, Wi-Fi in public areas, car park, room service, airport transfer. In addition, all guestrooms feature a variety of comforts. Many rooms even provide television LCD/plasma screen, internet access – wireless (complimentary), non smoking rooms, air conditioning, desk to please the most discerning guest. The hotel offers fantastic facilities, including garden, to help you unwind after an action-packed day in the city. 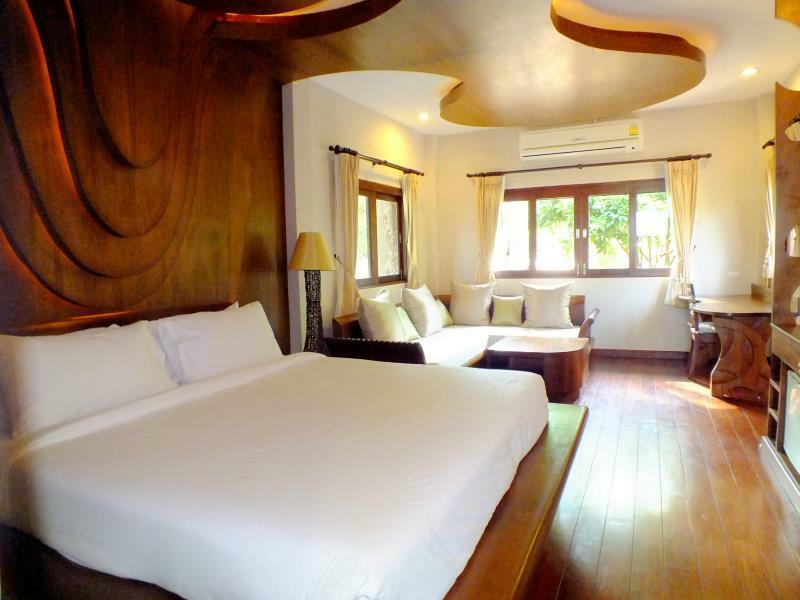 Bura Resort is an ideal place of stay for travelers seeking charm, comfort and convenience in Chiang Rai. "Warm welcome, good view and breakfast." The owner and staff were polite and kind. We stayed at Deluxe room for 1 night. It was clean, spacious and well-designed. The bathroom has rain shower and bathtub with garden view. Love the peaceful scenery there. This small hotel is outside of the city in the peace and quiet of the countryside. The owner ensures that this is not a problem and is very helpful arranging lifts and taxis. The surroundings and garden are breathtaking, and the rooms, which are individual houses are large and comfortable... the theme reminded me of The Hobbit. Each room has a private balcony and overlook the garden and waterfalls. The staff are charming and very helpful. This is a good boutique hotel. Wonderful location Important to me :Comfortable bed Quiet at night Friendly caring staff Internet good access Probably best enjoyed with own transport Evening meals good and a very fair price Only down and it is minor breakfast little variety Already planning a return next year. A really good place to chill out a little and breathe some decent air. My wife and I wanted a quiet, peaceful place to relax for a couple of days. Bura Resort was perfect. We stayed in the deluxe room and it was better than we expected. Huge windows, a comfortable bed, a sofa for two to lay on, and a giant bathroom. The food in the restaurant was very good and the staff did all they could to make our stay enjoyable. We will return. The only minor issues were that the wooden floor squeaked when you walked. This was only an issue if you woke up at night and tried not to wake your spouse. Also, the door on the shower could use a good scrubbing. again, these were minor issues, we loved it. This is a great hotel to stay at. A bit out of town, but worth it. There is a lot of wood used in the interior and from the outside kind of looks like a rock / cave with water flowing down. Quite magical and set in beautiful gardens. We look family that were visiting us there and they loved the place and raved about it. Food is plain and simple but good. Staff are friendly and accommodating. The bedrooms are huge and lovely and the bathroom is massive. This place could really use a pool as there are tons of water and little waterfalls everywhere on the property. What an incredible place this is! It is about 20 minute motorbike drive out of the city. IT IS LOVELY! So much attention to detail has been put into it. Your room is surrounded by waterfalls and greenery. Inside the rooms are very comfortable and large. They easily picked up up at the airport and also brought us into town to rent our motorbike. The breakfast is simple, made to order, while you sit under a large waterfall on the deck. I highly recommend for couples if you want to get away into nature. I'm currently staying and the hospitality is the best among what you can expect for normal hotels and resorts. The property makes you Wow showing their efforts for every single details. It is near the airport and surrounded by beautiful nature which will bring you the galaxy at night. As I arrived very early in the morning with early flight, they tried to help me check in early and even upgrade the room. As soon as I started reading looking over the mountain, I wanted to come again in the nearest time. The restaurant has good Thai food options and the price is very very reasonable for what they are cooking. Hannah and Jazz try their best to get you to some places in the neighborhood and pick you up from there. Lovely place with the nicest staff and cute pets! This resort is really spectacular for relaxing in a beautiful garden and pond environment. The restaurant serves excellent food which is quite reasonably priced for a resort, and with a good selection. The only "complaint" is that the wifi quality is poor and I had weak 3g signal (with DTAC). If you really need internet connectivity, it's possible by sitting in just the right spot, but it's not optimal. For us it was no problem, we were having a nice quiet weekend, but be aware if you depend upon internet. We had one of our best stay here in Bura. Hannah, the staff here, is absolutely nice and can speak English as well. Though the other staffs at the resort do not speak a single English, I do not see an issue here cause they still make you feel very much welcomed. Oh, and by the way my boyfriend had his best Thom Yang soup here at the resort so check that out as well! Excellent hotel, very nice and big rooms, just like in the pictures maybe even better! Room was very clean, very nice an calm enviroment at the resort. Breakfast and restaurant is also good. The staff and the owner must be the most friendly i have ever seen in a hotel, i would really recommend this place to anyone as i cant say anything bad about it. CUTEST DOG EVER!!! The dog guides you to your table, I've never seen anything like it, it was absolutely adorable! The rooms were really great (large, comfortable, clean) and the staff was excellent. The only downside of this place is that it is a bit isolated (which can be an upside for some, I guess) but it makes it a bit hard to find. Nevertheless, I definitely recommend this place, well worth its cost. Bura Resort is a gem: It's a wonderfully tranquil place to relax for a few days and the rooms are superb - along with all the woodwork, the bathroom was a particular highlight for us. Moreover, all of the staff were lovely, but I'd especially like to thank Jazz and Hannah for being so helpful during our stay. If you're looking for a place to unwind, stay here and enjoy. You can tell how cared for this resort is by looking at the details in the rooms and the tended gardens. I stayed in a villa by the water and it was perfect. I loved that bath too. The staff are exceptional. 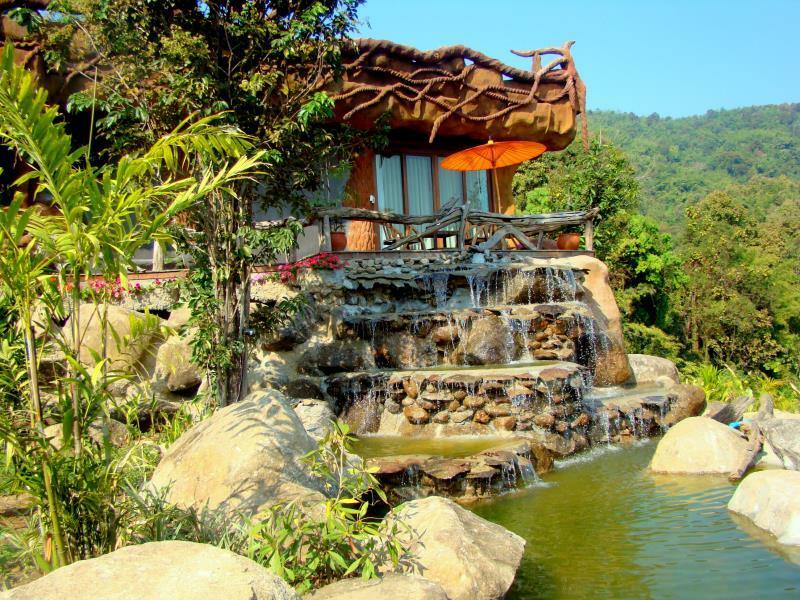 Bura resort hotel has been beautifully designed amidst waterfalls and garden. Its a short drive away from main city area but its worth staying there. Hannah at the reception was extremely helpful and literally manages the place with other staff. Its a villa room with waterfall outside the room. The rooms are big with lovely wood furnishings. Bathroom was awesome with nice bathtub and rain shower. Bed and linen were of very good quality. Huge sofa in room. Room can do with more brighter lighting. Waterfall with small ponds gives it a great beautiful feeling. Breakfast and dining area was very nicely designed next to a waterfall. Hannah provided pick up and drop off as well as made many other arrangements to see city and get massage.Kit the cook prepared lovely local Thai food which was very delicious. Food was very reasonably priced. Massage is very reasonable in Chiang Rai. Very relaxing place with great staff. Will definitely go back again. i really love that place! !, the decor outside, the ''villa'' with the waterfall all around, the accomodation was huge et very nice!, i was surprise, for this price, i was expecting something looking cheaper,but it wasnt!, the staff are great, specially the receptionist who was very friendly and have a very good english. i will go back thats for sure! Had a wonderful 2 nights stay, staffs were helpful and foods were good. External of room is designed to look like a cave, very natural design with a nice ambient. Lovely cascading water features infront of rooms and at dinning area. It is only about 15 to 20 minutes to city and the staffs can call-a-taxi for you. I will recommend this resort.